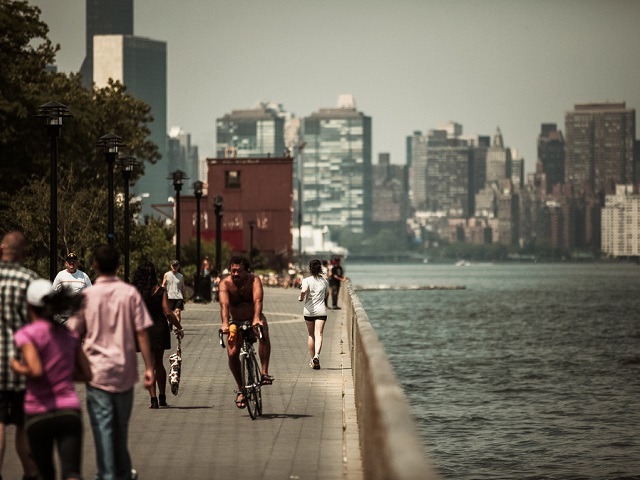 New York City, like many cities around the globe, is reshaping the design of its waterfront to be increasingly resilient to rising sea levels and an unpredictable climate. Photo by Stefan Georgi/Flickr. The Massachusetts Institute of Technology (MIT) and ICLEI, the largest worldwide association of local governments, released a study last week showing how climate change has become a priority for cities across the globe. Entitled the “Urban Climate Change Governance Survey,” the study was based on a survey of 69 questions conducted in 350 cities to get a sense of the key priorities and implementation strategies at play to reduce emissions and increase overall resilience. The survey found that 75% of cities now see climate change as an essential element in their overall urban planning strategies. This is crucial, given that cities accounted for over 70% of greenhouse gas (GHG) emissions as recently as 2008. Read on to learn more about what cities are doing to tackle climate change, and where they’re falling short. The recent survey shows that actionable data is a pivotal component in fully assessing the impacts of climate change. Cities realize this, and now 85% of cities have a local inventory of GHG emissions. Still, only 15% of cities invest in controlling emissions resulting from the consumption of goods and services in the city, even if they have data showing that they need to act. This means that although collecting data is a pivotal component in pushing forward climate change policies, it is not enough. There is also an important difference in whether cities decide to pursue mainly mitigation – curbing their contributions to global climate change – or adaptation – planning for the impacts of climate change – strategies. 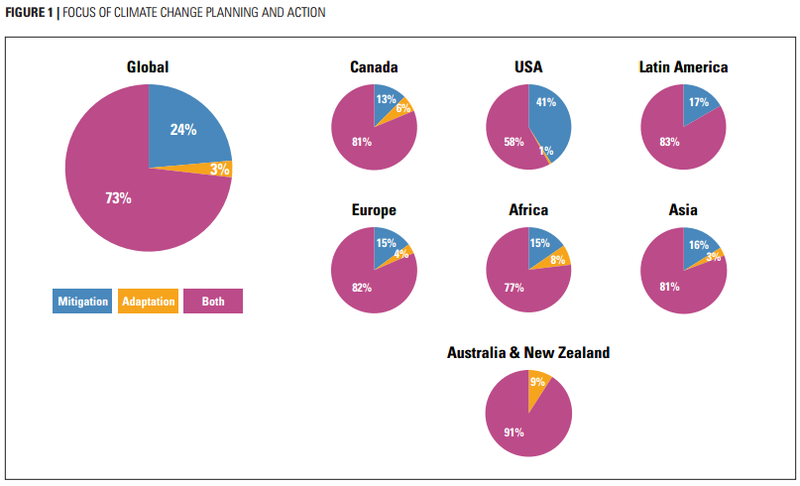 In the United States, mitigation policies account for 41% of the climate change planning agenda, whereas Australian cities are pursuing largely adaptation-oriented goals. These regional differences show that climate change is likely to impact cities differently, but such wide disparity in tactics also hints that cities are not sharing best practices well enough to effectively pursue mitigation and adaptation strategies simultaneously. Each country plans for climate change based on its own set of needs—some attempt to mitigate climate change’s impacts, others try to adapt. Image via Urban Climate Survey/MIT. Almost all 350 cities surveyed shared the realization that climate change cannot be combatted by government alone, but requires partnerships with businesses and community organizations. The survey found that industry is highly engaged in responding to climate change, with 25% of cities believing that local businesses have been crucial to the creation and implementation of their plans for climate mitigation, while 48% of the cities said that civil society organizations, nonprofits, and other organizations are involved in the climate planning process. However, although partnerships have been important to implementing climate change strategies, only 63% of cities have staff dedicated towards pursuing climate change partnerships. Another of the key findings of the survey was that cities feel as if the economy and the environment are a part of a zero-sum contest. Managers and city leaders understand that climate change is a priority – but many cities are facing what they view as conflicting priorities. Of cities that do include climate change in their planning, only 21% see tangible connections between the response to climate change and other local development objectives. But, as projects like the New Climate Economy have shown, combatting climate change and economic growth are not at odds. For example, Portland, Oregon, USA has invested in a pilot program called Clean Energy Works, which has simultaneously generated 400 jobs while reducing carbon emissions by 1,400 tons per year. 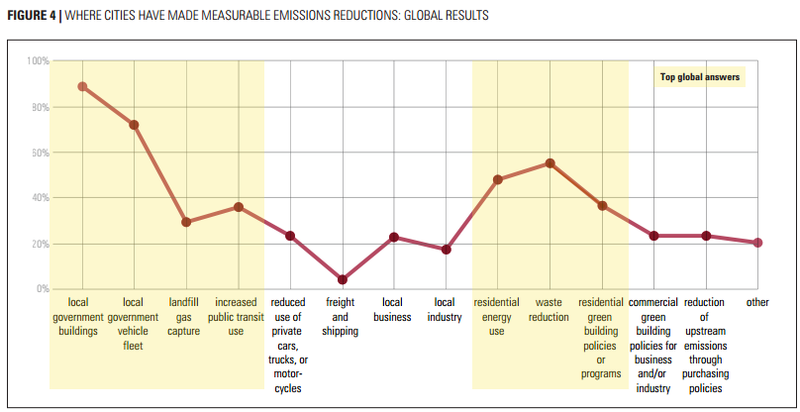 The survey went into depth to measure precisely how cities have sought to reduce their emissions throughout sectors. Cities generally focus first on buildings (89%), public fleet of motor vehicles (72%), and waste reduction waste (55%). Next the focus falls to residential energy (48%), policies and programs for sustainable residential buildings (36%) and increased use of public transport (36%). Reducing the use of private motor vehicles – a goal for only 22% of cities, and creating local services and businesses – a goal for only 18% of cities, were low on the list, identifying an area of key action as city leaders look to put their cities on the path to sustainable growth. Cities have a wide range of different priorities in what sectors they target to lower carbon emissions. Image via Urban Climate Survey/MIT. Along with highlighting where cities’ efforts lie – and perhaps more importantly where they are not acting – the study also provides insight into four key components cities should begin with to facilitate a larger role for climate change in urban planning. These are the leadership of mayors and senior managers; collaboration with a wide variety of groups, from local governments to think-tanks; good data to work with; and finally, the allocation of funding and staff for specific climate-change programs. Although a tall order, taking the often hard steps towards incorporating climate change into urban plans now will have deep and enduring consequences on the fate of future cities.